Derek Thompson started the game for the Spokane Indians. Minor league baseball has a lot of charm, thanks to small ballparks, oft-wacky fan promotions and the chance to see future big-leaguers learning the ropes. Once in a while, the actual games between the foul lines live up to anything a major-league game can provide. 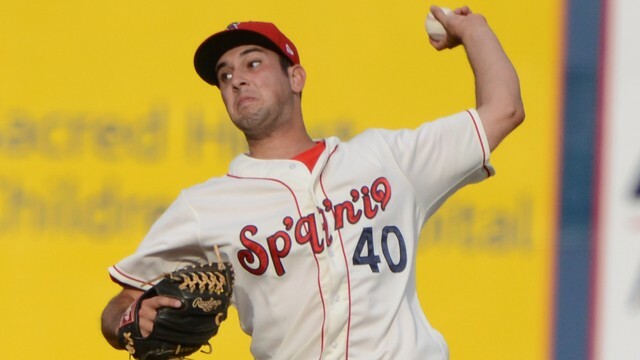 Such was the case for the Spokane Indians last season when four pitchers combined to pitch the Northwest League's first extra-inning no-hitter. Now, thanks to the public rallying to vote for the game, that memorable Indians moment was awarded the Minor League Baseball, or MiLBY, "Game of the Year," garnering 32 percent of the vote tallied between eight nominees. The four players who tossed the no-hitter were Derek Thompson, Shane McCain, Adam Parks and Luis Pollorena. The Indians eventually won the game thanks to Luke Tendler's three-run homer in the top of the 11th inning. Well-played, voting public! And kudos on a great game, Spokane Indians!